MARTIN GUITARS EVENT - MAY 14th 2019! If you are a lover of Martin guitars, or if a Martin guitar is in your future you wont want to miss out on this special Martin event May 14th 2019! Hosted by C.F. Martin Representative Tony Manzi! 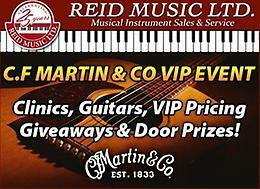 Educational clinic, Martin guitars on display, VIP pricing, Giveaways and door prizes! Free leather sofa. Lots of wear from being in recroom but structurally very solid. Can be covered with blanket. Going to dump tomorrow morning if no one wants it. Pls don’t say u are interested if u r not going to show up. Pick up in Southlands. 2009 Mattel Disney Princess Cinderella, and Snow White Light up Ribbon Bride Necklaces. Nice unique item.Ornaments measures approximately 4" and the Ribbon hangs 9". Total hanging length is 13". Comes from a smoke free home. $20 for the pair. Save Up To $800.00 On In Stock Yamaha Generators. All Yamaha Generators Come with 3 Year Factory Warranty. Yamaha EF2600C (2600 watt) MSRP: $999 SALE PRICE: $599 Yamaha EF2000iS 2000 Watt Inverter Generator MSRP: $1349 SALE PRICE: $799 Plus Free $50.00 Wiseman's Gift Card Yamaha EF30iSEX 3000 Watt Inverter Generator MSRP: $2649 SALE PRICE: $1949 Yamaha EF2800iX Inverter Generator (2800 watt) MSRP: $1,999 SALE PRICE: $1,549 Yamaha EF72DP Generator (7200 watt, Manual Start) MSRP: $1,999 SALE PRICE: $1,199 Yamaha EF72DE Generator (7200 watt, Electric Start) MSRP: $1,999 SALE PRICE: $1,599 EF20IST Twin Parallel Inverter Generator (2000 Watt Twin Hook Two Together for 3000watts) MSRP: $1,499 SALE PRICE: $899 YP20GJ Yamaha 2" Water Pump MSRP: $599.99 SALE PRICE: $399.99 YP30GJ Yamaha 3" Water Pump MSRP: $699.99 SALE PRICE: $449.99 www.wisemansales.com www.facebook.com/wisemansandservice www.twitter.com/wisemansales *Cash prices shown. Unit prices are subject to applicable taxes, freight and PDI charges. Save $550.00 On A New EF2000iS Yamaha Generator. Plus a Free $50.00 Gift Card. 2019 Wildwood 27REI Double Slide Couples Trailer with Kitchen Island. Finance for only $139 biweekly tax included. Brand new 20198 Wildwood 27REI double slide rear living travel trailer. Great open floor plan with large rear window. Features include kitchen island, electric fireplace, 32" tv, stand up shower, two power awnings, power stabilizer jacks, A/C, free standing kitchen table, upgraded denver pillow top mattress, solid surface counter tops with undermount sink, stainless steel appliance package, power front jack, and outside speakers. Includes weight distribution towing kit and starter accessories. Fully furnished home located Lower Bear Cove , home on a beautiful piece of land.main floor laundry,it has a attached garage and a 20x24 detach garage.included also is a ride on lawnmower and a snowblower.wood burning fire place in living room,source of heat is wood and oil (hot water radiation),new oil tank in 2009 and new sewage tank in 2014.wood splitter also included.almost totally renovated.if you would like more information you can give me a call @ 709-456-8934 or send me an email Snowydiesel1997@outlook.com.reason for selling relocating.fridge,stove,dishwasher,stand up deep freeze,smaller deep freeze,washer,dryer,and lots more not listed above.serious inquires only please. Ikea MALM end table / nightstand in white. In good condition with a tiny bit of wear and tear, see pics. Drawers work great. $40 pick up in witless bay or can possibly deliver in town during weekdays. Smoke free pet free home.